Abstract. We describe a general strategy to analyze sequence data and introduce SQ-Ados, a bundle of Stata programs implementing the proposed strategy. The programs include several tools for describing and visualizing sequences as well as a Mata library to perform optimal matching using the Needleman–Wunsch algorithm. 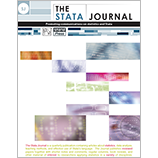 With these programs Stata becomes the first statistical package to offer a complete set of tools for sequence analysis.